The order throughput (throttling) control feature allows an administrator to configure the number of orders per second that a trader may send to a given TT Gateway. The TT Gateway will reject orders submitted in excess of the configured throttling limit per second. The User Risk tab of the User profile contains the order throughput (throttling) controls. To prevent more than a specific number of orders per second, check the Per TT Gateway, prevent more than X orders per second checkbox and enter the number of orders per second. Each add, change, and delete message to the exchange counts as an individual message. Cancel/replace actions count as two messages (a delete and an add). Cross/Intention to Cross (ITX)/Wholesale/Over-the-counter (OTC)/Inquire/series create/RFQs do not count towards the number of orders per second limitation. The TT Gateway accepts orders while the number of orders in a one-second time frame remains at or below the configured throttling maximum. When the maximum number of orders allowed in a second is exceeded, the TT Gateway rejects all new add orders. When one or both messages in a cancel/replace action exceeds the limits, the TT Gateway rejects both the delete and the add portion of the cancel/replace action, and the order remains working. The TT Gateway counts, but will never reject stand alone delete orders. 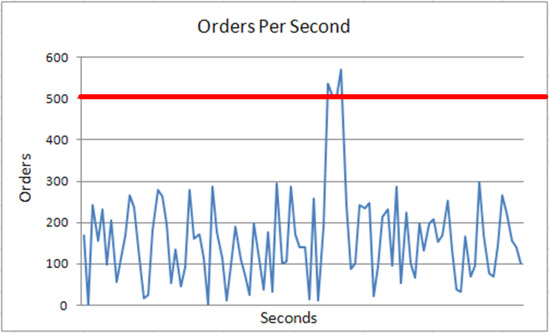 In this example an administrator has configured a user with an allowed order throughput of 500 orders per second. The TT Gateway will allow no more than 500 orders per second for that user. It will accept all orders up to and including the 500th order in a one-second time frame, and will reject ALL subsequent orders within that second. From the Users window, click a user row and then click Edit. The Edit User window appears. The User Risk tab contains the order throughput controls. To prevent more than a specific number of orders per second, check the Per TT Gateway, prevent more than X orders per second checkbox and enter the number of orders per second. To override the maximum orders per second allowed for all TT Gateways assigned to a selected user, check the Prevent more than X orders per second (overrides the User-Level setting) option on the Assign Gateway Login to Available Users or Edit User Gateway Login window. This option allows you to set the maximum rate of orders per second allowed per TT Gateway. The value entered for this option also appears in the Max Order/Sec (Override) column in the Selected Users pane of the Assign to Available Users window. For each selected user, you can edit the value in this column on a per TT Gateway basis to control the rate per gateway instead of assigning one rate for all gateways assigned to a user. To set the Prevent more than X orders per second (overrides the User-Level setting) option, refer to Editing a User's Gateway Login Attributes and Assigning Users to a Gateway Login.